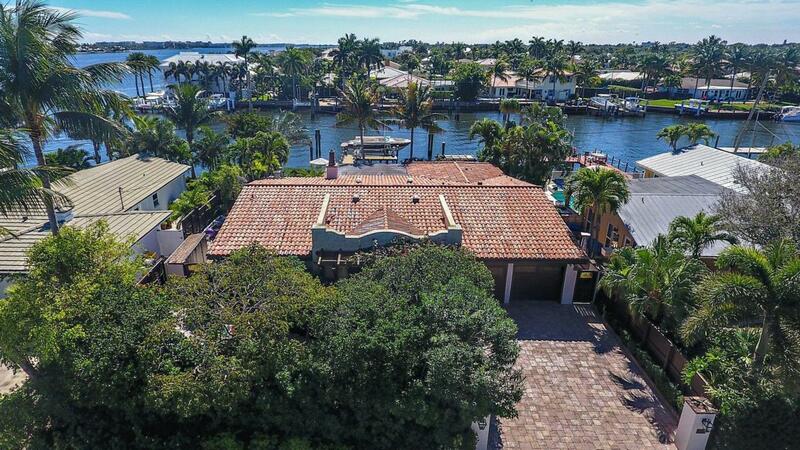 Tropical Waterfront Retreat, a true boater's dream home! 75 feet directly on deep water canal just a few homes off the Intracoastal with private dock. Own your own piece of paradise with this amazing and spectacular 3 bedroom, 4 bath residence, with garage and pool. Situated behind a gated privacy wall and lush tropical landscaping, a gracious and spacious entry foyer leads to a bright and open living room complete with built in cabinetry and wet bar. Cathedral wood beamed ceilings, wide planked and pegged floors combining phenomenal open spaces with panoramic water views. An exquisite ''French Country'' kitchen with farmer's sink, island, 6 burner wolf stove, 2 drawer dishwasher and custom cabinets. Fireplace in dining room with French doors leading to alfresco covered patio.Luxurious master suite with 2 sets of French doors, panoramic Intracoastal water views plus 2 walk-in closets and gorgeous bathroom with double vanity and glass shower. 2 additional guest bedrooms with ensuite baths. Both have vaulted ceilings. One has French doors opening to a private courtyard and the other has Intracoastal water views. Air-conditioned garage with additional storage. Stunning exterior landscaping and outdoor living areas. Private deep water dock with boat lift, electric and water. Gorgeous tropical settings with gas fireplaces, outdoor ambience lighting and phenomenal water views with sparkling pool, outdoor shower, plus, plus, plus! Listing provided courtesy of Coldwell Banker/ Wpb.